The Oompa-Loompas had it easy. Everybody who stepped out of line was guilty. The stupid-a__ed TSA is picking every 10th passenger for screening. More than 800 million commercial airline fares are into, out of, or pass through the U.S. per year. Screen 1 in 10 (to avoid profiling), & that's 80 million times someone is pulled aside by airport "security" to avoid "profiling". Why? Because 19 whack-job Muslims hijacked 4 planes on September 11, 2001, another whack-job Muslim tried to blow up a plane with his shoe, & another whack-job Muslim tried to blow up a plane with his drawers. If you ask me, the way the TSA is doing things is like buying a .50-caliber Barrett to go polar bear hunting, chartering a boat to take them 60 miles out into the Gulf of Mexico, & shooting every 10th dolphin. Do you even TRY to pay sttention to the visual for this post? You know,"nonsense"..."wisest of men"...? How can you take such a fun, whimsical sentiment and turn into an excuse for bitter hyperbole toward the TSA? Wrong comment on the wrong thread. Try harder to ADD to the thread....not TAKE AWAY. 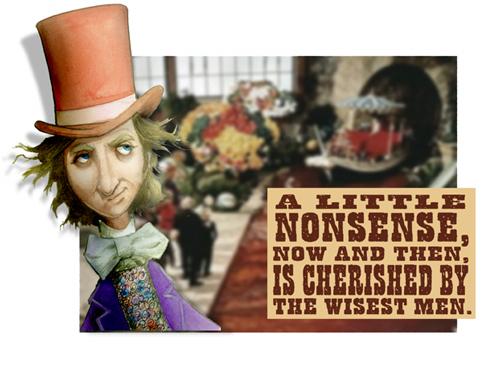 Given how 'wise' Obama is purported to be, I'd like to see his idea of 'a litte nonsense'. Oh, wait. That would be his administration, wouldn't it? Mmmm, chocolate. Err, sorry. On a low carb diet here! One thing I learned a long time ago. NEVER get between my wife and a piece of chocolate. And NEVER take the last piece! Nonsense, combined with silliness is vastly underrated. The Marx Brothers and the Three Stooges would heartily agree. GF mentioned the TSA & Oompa-Loompas & I just ran with that. I don't know why my anger would be showing. With such a wonderfully competent, transparent administration that consistently shows so much respect for both the Constitution & the citizenry, I guess I should be be able to see how everything is candy daffodil teacups & lollipops (aw, man--Michelle ate all the good stuff & all that's left for us is Fresca & a bunch of wax lips & teeth sweetened with stevia). I imagine the administration taking a trip to the chocolate factory: Janet Napolitano as a bloated blue ball, tipped on her side to be rolled away to have the begeezus squeezed out of her--kind of like a hammer pounding on one of Larry's dog ticks; Barry parting the chocolate river so the entitled ones could cross over into the land of mopes & dummies. Q: Why are so many people irate about Nativity scenes being placed on "government" property? A: It's a sore reminder that there are at least 3 more wise men in the Nativity than there are in all of government. 'Cause I've got a golden ticket. and the touching by the TSA. And with a golden ticket, it's a golden day. Mr. Backlinks obviously isn't paying attention. This IS a PROFESSIONAL's blog, you dimwit. Howzabout you pick up a job throwing handbills out of the window of your car? The "advertising" will be just about as effective. This is another eye opening blog and I am very happy that i have found this post. What exactly are some really good mp3 players for kids? My cousin is 5 yoa and for christmas I'd like to see to buy her a ipod, she loves my nano but I think it could be difficult for her to apply it. Are there any good ones for kids? Thank you so much for giving everyone remarkably memorable chance to check tips from this website. It is always very ideal and also full of a lot of fun for me personally and my office acquaintances to visit your web site at a minimum three times a week to see the latest tips you have got. And indeed, I'm also at all times amazed considering the extraordinary concepts you serve. Certain 1 ideas in this article are clearly the most impressive we have all had. Thanks for because of this spectacular post. i am invariably near to the present up out for content material material and was fortunate to uncover you on yahoo i'm going to absolutely be back nonetheless again againg to establish what other spectacular content material you post. One more thing. In my opinion that there are lots of travel insurance web-sites of trustworthy companies that let you enter holiday details and find you the rates. You can also purchase this international holiday insurance policy on internet by using your credit card. Everything you should do is to enter all travel information and you can be aware of the plans side-by-side. Simply find the package that suits your financial budget and needs and after that use your credit card to buy the item. Travel insurance online is a good way to do investigation for a reputable company pertaining to international travel insurance. Thanks for discussing your ideas. This page contains a single entry from the blog posted on November 22, 2010 6:37 PM. The previous post in this blog was Stink...STANK...STUNK.